I Love Cloth Dolls and Cloth Crafts. : Well Well Well...here's something I can show you. Well Well Well...here's something I can show you. I have been thinking of making a nice Apron for myself for ages...well after Diana posted a link on our group for some online freebies I could not resist and had to run out and buy the fabric for my very first apron...I intend to wear this apron all the time just like Grandma did...hehehe. I love the thought of a gorgeous apron covering my everyday clothes while I cook and clean. why did we ever stop wearing these lovely little treasures. I will post again once I have sorted out exactly which apron I will make. so for now here is a sneek peek at the fabric I bought to make it with from my favourite store Bargain Box fabrics in Ipswich. the pink is for the inside and the floral is for the outside. It is going to be very pretty! It has a retro feel! Lovely fabric very Cath Kidston. How how fresh and bright for an apron...love it Amanda...so what style...a full one or a half cute frilly one? it is a full apron with frills around the top and bottom. I do have pics with me wearing it but they are completely horrible so they are not going up at all...however I do have some pics of Hubby wearing it for a joke so I might sneek one of those up...I deliberately made it bigger because apart from the fact i am a big woman, I also like a big apron that i can wrap around my sides. It is simply divine darling, there something about the domestic man. I hope there is something under that apron. Finally Finished...Now Where's That Baby? 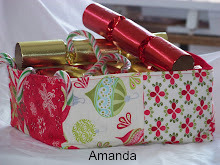 FREE Tote Bag Tutorial...Give It A Go.